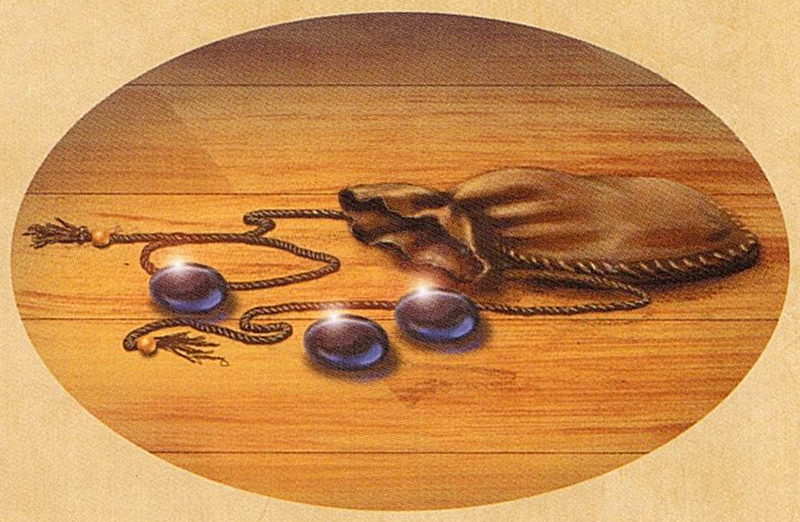 The Blue Elfstones were one of five sets of Elfstones. Consisted of three blue stones, each the size of an average pebble. All five sets of Elfstones were hidden in a stronghold in Arborlon. When the other Elfstones were stolen by Charis, he left the Blue Elfstones for Aleia Omarosian, telling her to use them to find him. When she was unable to find him, she returned the Blue Elfstones. At some stage, Pancea Rolt Cruer had been buried with the stones, and they stayed with her remains until the time of the Great Wars when her shade passed them on to Kirisin Belloruus. Handed down through the Belloruus family whilst they were living in The Valley. Mistral Belloruus was preparing to hand them over to her granddaughter Phryne Amarantyne, and had let her try them out, before Phryne was arrested for allegedly murdering her father. Allanon had obtained the Blue Elfstones and left them with Shea Ohmsford for him to use as protection against the Skull Bearers. He brought them with him when he left on his quest and were lost during his escape from Skull Kingdom. They were later returned to Shady Vale by Panamon Creel. Shea Ohmsford had handed down the stones to his son Wil Ohmsford so when Allanon came for him at Storlock he already had the stones with him. After his experiences with the stones, Wil hid the stones as he did not ever want them used again. Jair Ohmsford found their hiding spot and when he left Shady Vale he took them with him, not wanting to believe that he could not find a way to use them. When the King of the Silver River visited him he was able to persuade Jair to hand them over, in return for magic from him. He then returned the stones to Shady Vale, where Jair found them when they all returned. The stones had been given to Wren Ohmsford as a baby, but as they were disguised as ordinary stones painted blue, she believed them only to be a memento of her dead parents. Despite the Addershag telling her she had magic, she still did not realise what they were until she was threatened by another form of magic. They remained with the Elven people until their disappearance. Were lost along with Kael Elessedil on his journey over the Blue Divide and were not with him when his body was finally found. Recovered and used by Ahren Elessedil. Ahren handed them over to Kylen Elessedil after returning to Arborlon. Khyber Elessedil took the stones from their hiding place and brought them to Emberen, hoping Ahren Elessedil would teach her how to use them. Khyber had returned the stones long ago, believing the Elves would keep them safe and use them wisely. 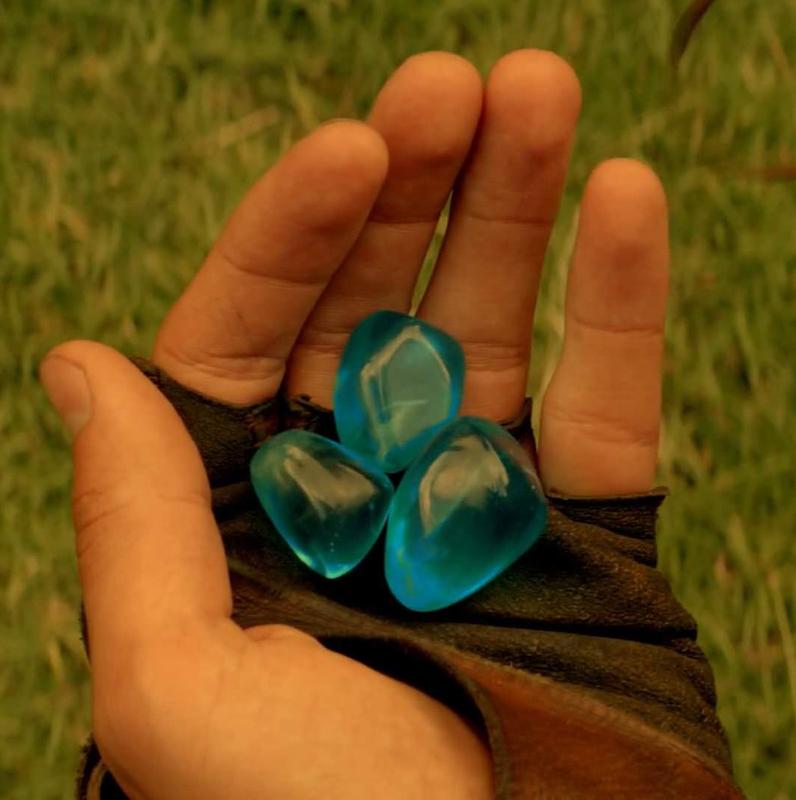 After the death of Shea Ohmsford, Heady Ohmsford kept possession of the Blue Elfstones. Just before she died, Heady passed the stones on to Wil Ohmsford.